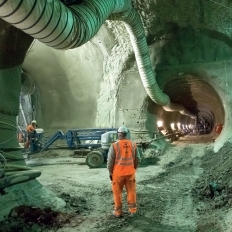 Taken from this APM article, we see this story from Crossrail showing the value of collecting and re-using Knowledge in the form of lessons and innovations. "Crossrail has developed its own ‘innovation portal’ in order to capture, track and develop innovation across its supply team. The portal is also a useful means of sharing ideas and unusual solutions to problems. Meanwhile, (John Pelton, Crossrail’s strategic projects director)'s team is proactive about encouraging innovation on the ground. An example of where this has worked in practice is the Pudding Mill Lane site in Stratford, east London. There, the contractors had struggled with erecting a reinforced earth wall. They tried a new technique, which had mostly worked, but there were a few problems. So they captured the lessons learned and logged the new construction technique on the innovation portal. A year later, contractors at the Plumstead site, also in east London, were having difficulties with a reinforced earth wall of their own, while battling severe time constraints. Fortunately, the innovation team was able to point them in the direction of the innovation portal and the lessons learned from Pudding Mill Lane. These were taken and developed further in order to devise a frame in front of the wall.